Click here to download and print the pattern. Cut out. Paint the clock base using Acorn acrylic paint. Let dry. Add a second coat and let dry. Trace the "icing" pattern on the clock base with a pencil. Paint the "icing" with Poodle Skirt acrylic paint. Let dry. Add additional coats until you have the coverage you desire. Let dry. Paint the center of the donut using Wedding Cake. Let dry. Add additional coats until you have the coverage you desire. Let dry. 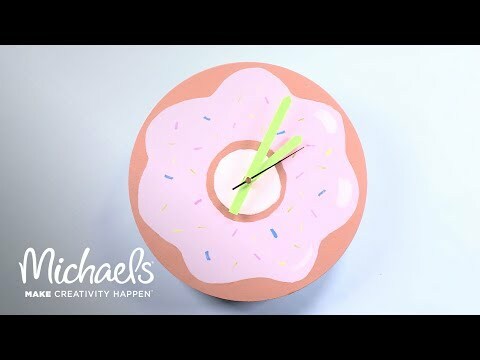 Add "sprinkles" on the icing portion of the donut by drawing small rectangles with paint pens. Let dry. Brush on the DuraClear® Gloss Varnish only onto the "icing" portion of the donut. Let dry and add an additional coat. Let Dry. Cut a strip of cardstock to fit the clock hands and adhere to the hands. Attach the clock movement to the back of the clock. Follow the directions on the package for installation. Linen Paper by Recollections®, 12" x 12"